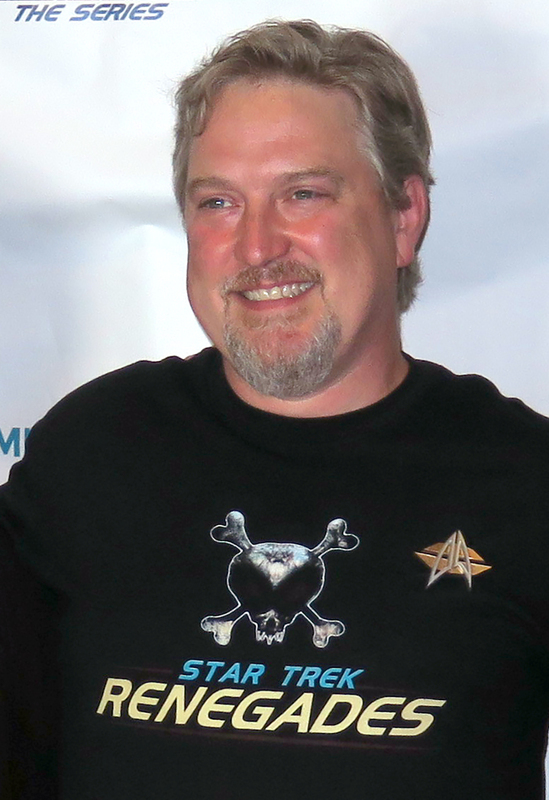 Last time, the world of Star Trek fan films was shaken to its core by a copyright infringement lawsuit against Axanar Productions in late December of 2015 followed by a call to Tommy Kraft of Star Trek: Horizon in April of 2016 telling him to shut down his new $250,000 Kickstarter for his sequel, Star Trek: Federation Rising. And what of STAR TREK: RENEGADES? In November, they had raised a very impressive $375,000 for their new continuing series. Even though CBS had rejected their offer to make Renegades into a pilot for a new Trek TV series (and by now, Star Trek: Discovery had been announced), the Renegades team hadn’t been told to stop. So it was full steam ahead with plans to use the existing sets and CGI models and props to make an ambitious TWELVE half-hour webisodes per year (yes, per year…that was the plan), beginning with a two-parter called “The Requiem.” It would feature both Nichelle Nichols as Uhura and Walter Koenig playing Chekov for one final swan song. Although Trek fan filmmakers were feeling very uncertain (and downright nervous) at the moment—with the Axanar lawsuit dragging on for months and mixed messages coming from JJ Abrams and the studios themselves—the show must go on, as they say. And so Star Trek: Renegades scheduled the first day of filming on “The Requiem” for June 22, 2016. 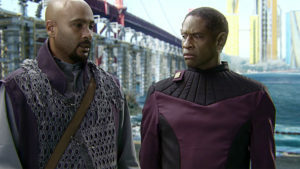 The initial scenes on day one were all green screen, featuring Nichelle and Walter, Tim Russ as Tuvok in full Vulcan make-up, and even Cirroc Lofton reprising his role as Jake Sisko. The production would also feature other veteran Trek actors reprising their roles, including Terry Farrel as “Jadzia” (minus the Dax symbiont), Robert Beltran as Chakotay, Aron Eisenberg as Nog, and even Hana Hatae as a grown-up Molly O’Brien! The sets were built, the costumes made, the studio rented…it was time to make an awesome new fan series! But there were still dragons out there needing to be slain. Other fan films and series were out there going full speed ahead, and CBS and Paramount were worried about what CBS VP of Licensing John Van Citters would later call a “space race” in a podcast interview. The Axanar lawsuit was intended to slow the speed of the space racers, but Star Trek Continues had just taken in $200,000 in a crowd-funding campaign and and Star Trek: Renegades now had $375,000 on hand to start making the first of a planned twelve episodes of their new series. Despite the Axanar lawsuit, the fan film “space race” was still going strong…and that’s something the studios felt that they needed to stop. Their tool of choice was a series of ten guidelines for Star Trek fan films. Follow them all, and your production would not get sued. Don’t follow them and, well, take your chances. A number of the guidelines had no relevance at all to Axanar (which is one the reasons we know the guidelines weren’t intended simply to stop Axanar). For example, taking the words “Star Trek” out the fan film’s title didn’t apply, as Axanar had removed “Star Trek” from its title more than a year prior. Also, Axanar didn’t use any costumes or props built or sold in quantity by bootleggers. And of course, the very first guideline forbids any ongoing fan series…and Axanar was only ever intended to be a one-and-done feature film. Had the guidelines been intended simply for Axanar, the 15-minute/2-part limit would have been enough. But other productions had many, many episodes, and were planning more (in Renegades‘ case, it was twelve more per year). The announcement by CBS and Paramount left the entire Renegades production team in a frenzy of uncertainty. What should they do now? As it turned out, on the morning the guidelines were announced, Renegades actually had already scheduled a break in shooting. All the green screen footage from the previous day was “in the can,” and the following day, they would start shooting on the sound stage sets. So they had less than 24 hours to figure out what to do next. Their final solution was, shall we say, unique. (It had the virtue of never having been tried.) They would surgically remove all traces of the Star Trek universe from their script. As I learned recently from writer/producer Sky Conway at the premiere of “The Requiem,” Sky wasn’t completely unprepared for this change. After their meeting with CBS the previous August, Sky had a sneaking suspicion they might have to “de-Trek-ify” their script…so he actually had a version already written and ready to go when the guidelines crashed down on them. So Chekov would now simply be an admiral named “Pavel.” The United Federation of Planets became the Confederation. The Romulans would become the Rigelians. The CGI ships would be redesigned. Nog would trade in his Ferengi make-up for something totally new. Chakotay, Dax, Molly O’Brien…all would get different character names. 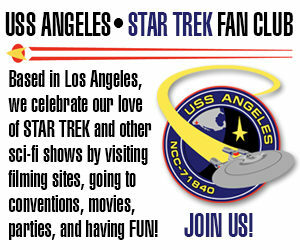 Oh, and off came the comm badges with the familiar Starfleet arrowhead emblem. 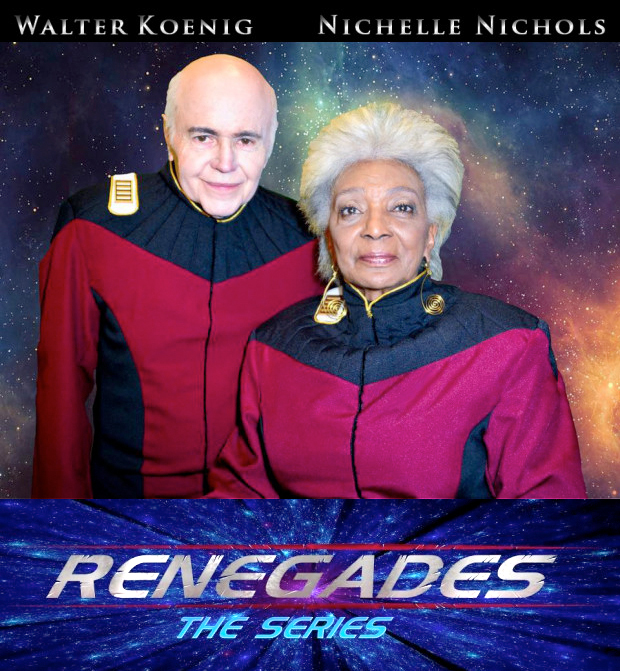 Star Trek: Renegades was now simply RENEGADES: THE SERIES. Tuvok’s pointed ears and comm badge were digitally removed. Of course, this didn’t solve the problem of the footage from the previous day. Nichelle would not be coming back again, and they didn’t have the money for a whole extra day of re-filming. So instead, all of that existing footage had to be “fixed in post” (post production, that is). The comm badges were digitally removed…along with Tuvok’s ears! Dialog was adjusted to add “Con” in front of “Federation,” change Tuvok’s name to Kovok, and a bunch of other annoying tweaks. It was a bit of a mess, but what choice did they have? Ironically (and frustratingly), when John Van Citters of CBS Licensing did his podcast interview three weeks later, he implied that projects that were already in production would be able to finish up and release what they were doing. These new guidelines were only intended on a go-forward basis. 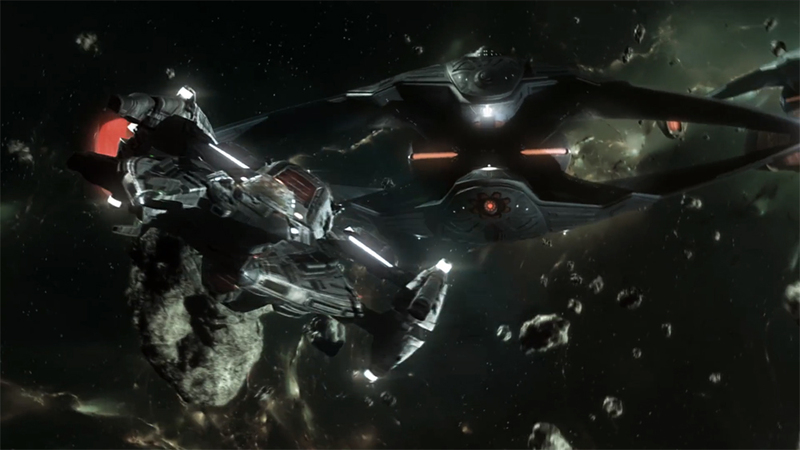 In other words, Star Trek: Renegades did NOT have to de-Trek-ify itself and become simply Renegades: The Series (although the guidelines still would have applied to any episodes that followed “The Requiem”). Unfortunately, by then, it was too late. The Renegades team had already made the announcement of their decision to abandon the Star Trek universe, and many scenes had now been filmed with non-Trek dialog, badge-less uniforms, and non-Ferengi alien make-up. Shooting was intermittent during the month of July, with long days in the studio followed by a few days off and then back to work again. Late on Wednesday night, August 10, director Tim Russ shouted, “That’s a wrap on Renegades, ‘The Requiem’!” And now the odyssey would begin on post production. New visual FX featured “Rigelian” warbirds. Actually, that post production work had begun a few weeks earlier with the launch of a new Indiegogo campaign intended to fund the costs of post production on “The Requiem” Parts 1 and 2. As had been the case with the 90-minute movie, the $375,000 raised so far was intended primarily to get them TO post production, which would then be funded separately. The goal was set for $60,000…the cost to complete post production on just Part 1. But if they reached $150,000, they could complete the entire hour-long episode…bringing the full production budget well over a half million dollars! Again, some wondered if the fans would still be willing to give, especially now that Renegades had removed all the “Star Trek” elements…not to mention that asking for more money on top of $375,000 might seem excessive. And let’s not forget the fallout from the Axanar lawsuit tearing apart the fan film community—how would that affect crowd-funding? In the end, the campaign finished just $10,000 shy of their $150,000 stretch goal…an amazing accomplishment! A few months later, another $30,000 would be generated from donations made directly through their Renegades website. “The Requiem, Part 1” debuted in February of 2017 exclusively to donors. Two months later, it was released to the general public, but not on YouTube. Instead, it was behind a firewall requiring a sign-up first. Although free, some fans objected to having to share their contact information before being allowed to see a fan film. And finally, on July 12, “The Requiem, Part 2” was shown for the first time at a theater in North Hollywood…along with Part 1. Again, cast and crew attended, with tickets sold to donors at $20 each. Here’s my blog with photos and descriptions of that special event. Although Renegades is no longer technically a Star Trek fan film, CBS and Paramount still had one middle finger available to salute the now-independent fan series. A rule was instituted for any licensed convention (essentially any Creation con) that would ensure that Renegades: The Series would NOT be allowed to have a presence there. When the Renegades team attempted to get a table at this year’s Creation Las Vegas Star Trek convention, they were told that no fan film featuring any Star Trek actor would be allowed to appear…even if it WASN’T a Star Trek fan film! But all pettiness from CBS and Paramount aside, Renegades still goes boldly and proudly onward. Sky Conway, along with co-writer Ethan Calk, have now written the show “bible,” fleshing out the universe and characters. Sky has been outlining, and he hopes to have the first draft of the next script completed in another month or two. There will be a mostly new cast that will explore and expand more of the Renegades universe. And even though it won’t be “Star Trek” as we all know it, it will still have that same Gene Roddenberry feel and inspiration. My emotions over their action had calmed down until I read this blog post. The continuing arrogance of CBS/P who think they’re slave owners who can control what happens with their slaves got me going again. On a positive note, good for the Renegades effort. More and more such efforts will draw money and viewers away from the dying networks and movie studios and into a world where quality matters and creativity counts. Hi Jonathan Lane i read your article and found it very interesting. Below is a link to an article about the news series Orville which you should have a read. It’s very hard for one huge network/studio to successfully sue another…as both have VERY well paid legal teams. Because Star Trek itself was based upon other space and even nautical tropes (like Buck Rogers and Horatio Hornblower), it would be a challenge to prove that Orville is copying Star Trek and not that both shows simply were inspired by the same source material. Also, the two shows ARE quite different. Mr. Spock was never Captain Kirk’s ex-wife. There was no regular character from any series who was from a single-gender race or species, nor was there a talking blob. The ship is very different, the uniforms are different, and the comedic approach to the 1-hour drama is unique. I wouldn’t be expecting a lawsuit. This is exactly what I told AXANAR to do….. It wasn’t an option. They were already being sued over Prelude. Changing the Axanar movie script would not have made the lawsuit go away. I’m not sure NBC would touch it–not because Renegades isn’t good but rather that it comes with too much baggage that’s attached to CBS’s property. Sorry, just my gut feeling. I think that it was a great idea what Renegades did and no surprise that Creation would kowtow to CBSParamount, whoever and I’m going to support it regardless of what shape it takes. Previous Previous post: PACIFIC 201 releases NEW TEASER CLIP and needs $1,000 FAST! Next Next post: DREADNOUGHT DOMINION/STARSHIP VALIANT team up again for “COMMAND AND CONQUER”!